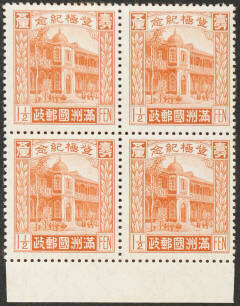 Postal prices were changed to bring foreign rates in line with Universal Postal Union regulated prices for international mail. 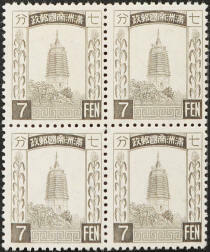 Japan and Korea airmail prices also changed at this time. 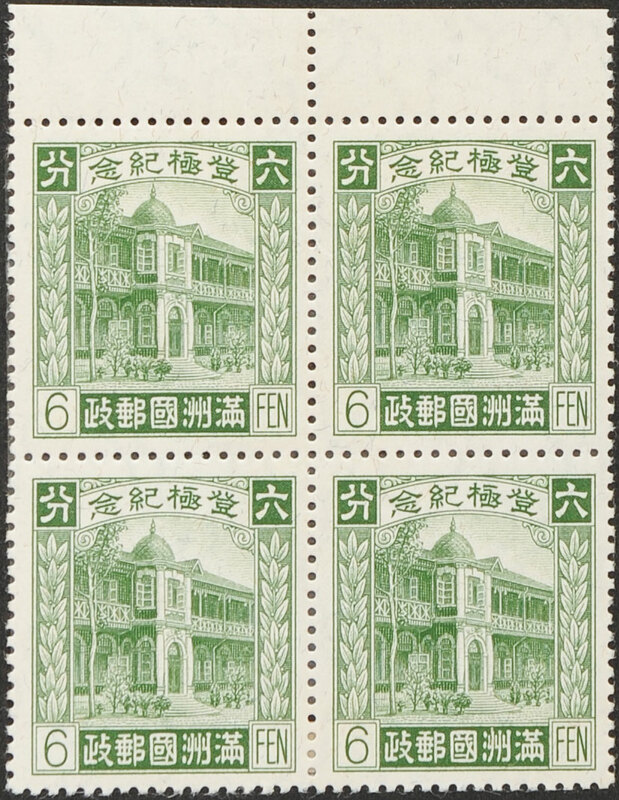 This set was issued between January & August 1934 and consisted of nine values, this time recess printed on watermarked paper. 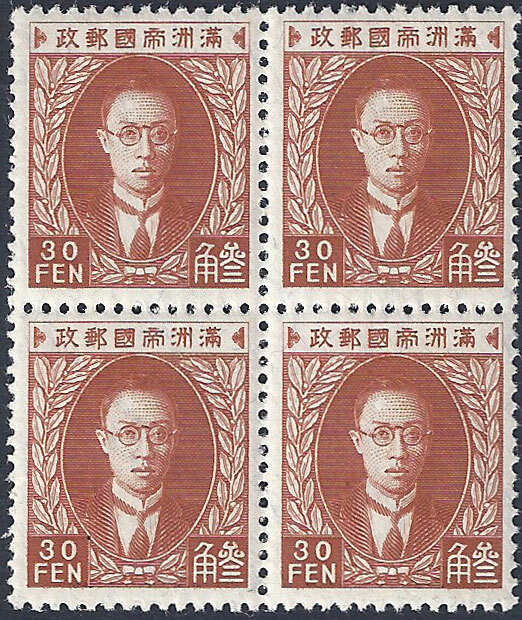 In March of 1934 there was a general reduction in postal charges, also throughout this year stocks of the First Regular Issue began to run low. 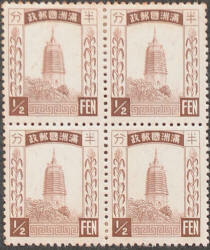 Values that were in short supply were reprinted and stocks of unnecessary values were allowed to run out. 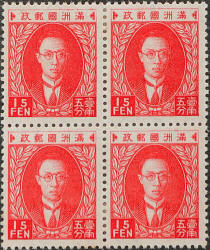 In February the 3f was reprinted as this would be the new domestic letter rate. 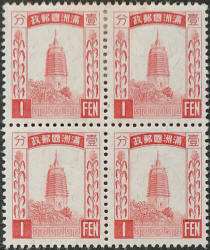 In March the 4f and 15f were also produced in limited numbers. 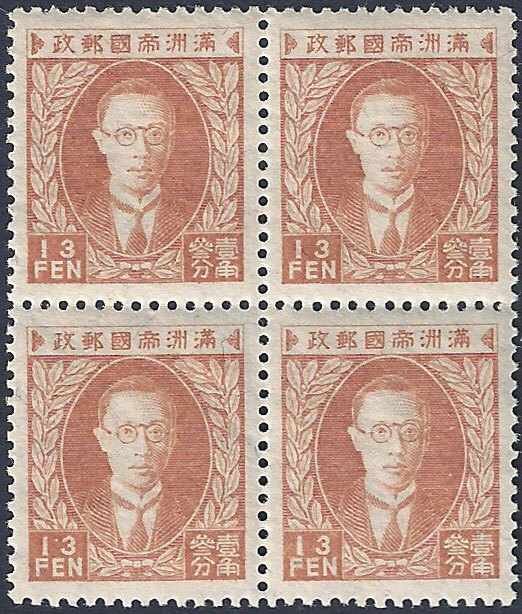 The 15f stamp was typically used for overseas mail and parcel post, the small number (100,000) printed means that these are now scarce (and valuable). 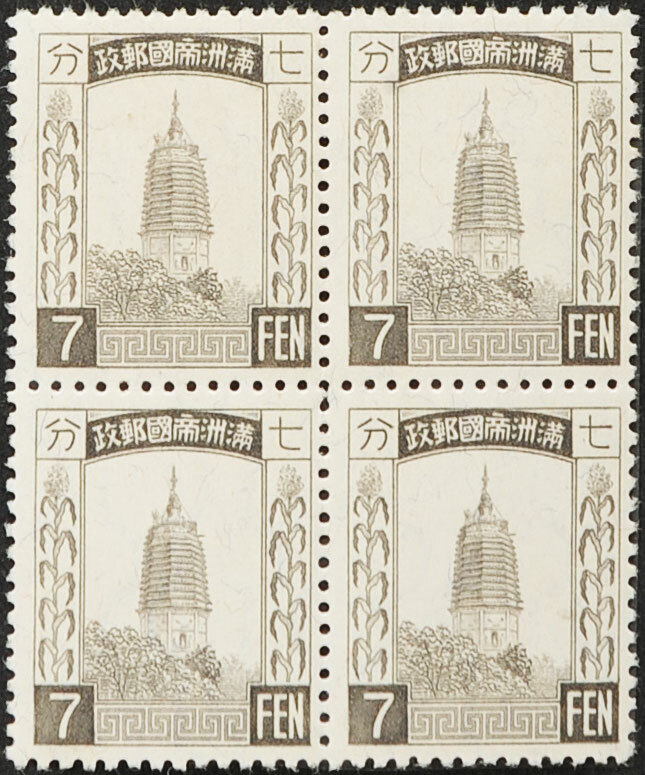 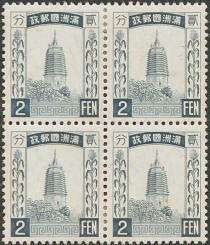 In April the 1½f stamp was reprinted and in high demand as it could now be used for postcards (both inside Manchukuo and to Japan), the 10f and 1 Yuan were also reprinted at this time. 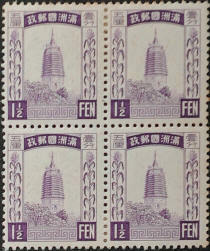 In August the ½f was re-printed. 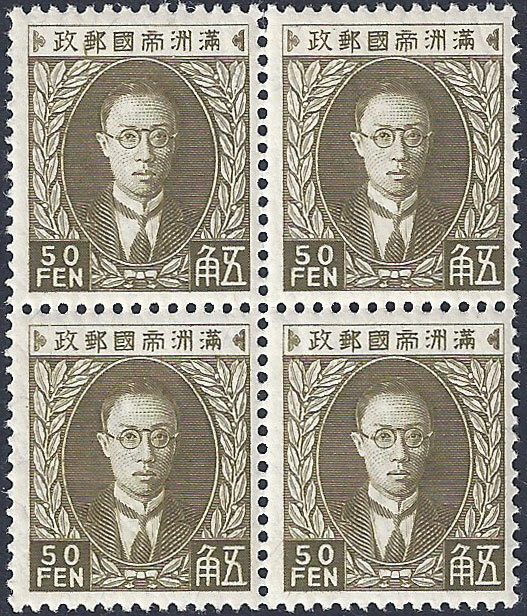 The stamps were recess printed on watermarked (see below) "granite" paper in sheets of 100 by the Japanese Government Printing Office in Tokyo. 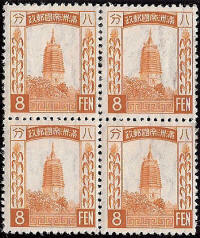 Due to the change in printing process most colours appear slightly darker than in the previous issue. 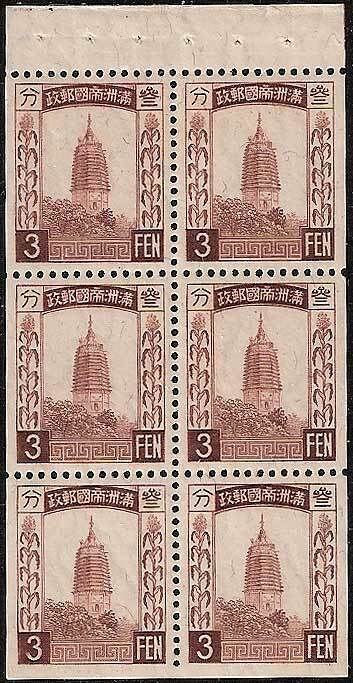 This is the first set of stamps in Manchukuo to appear with the security features, granite paper and a watermark. 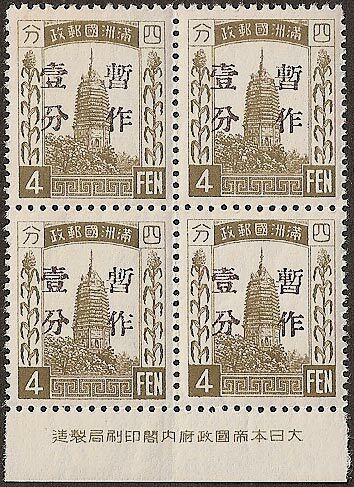 Granite paper is made by mixing finely chopped fibres of coloured silk to the pulp used to make the paper. 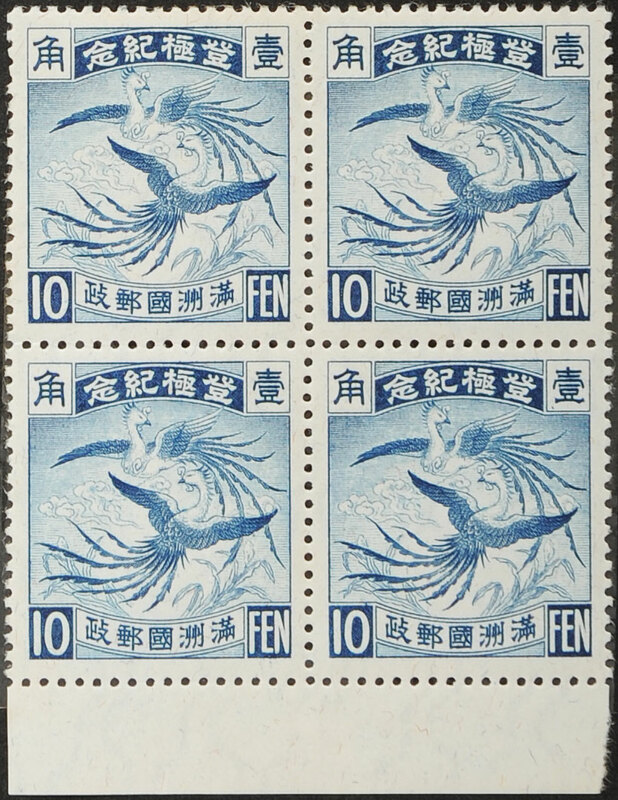 The watermark is interesting because this design is known to the Japanese as "Cloud Lines" and its introduction in Manchukuo pre-dates its appearance on Japanese stamps by three years. 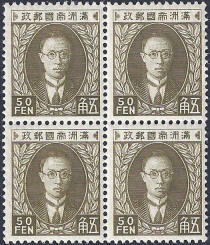 Designs by Mr Yutaka Yoshida. 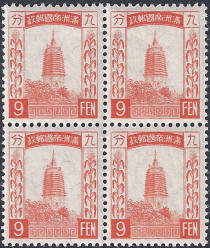 The stamps are 18.8mm x 22.5mm Perf 13 x 13½. 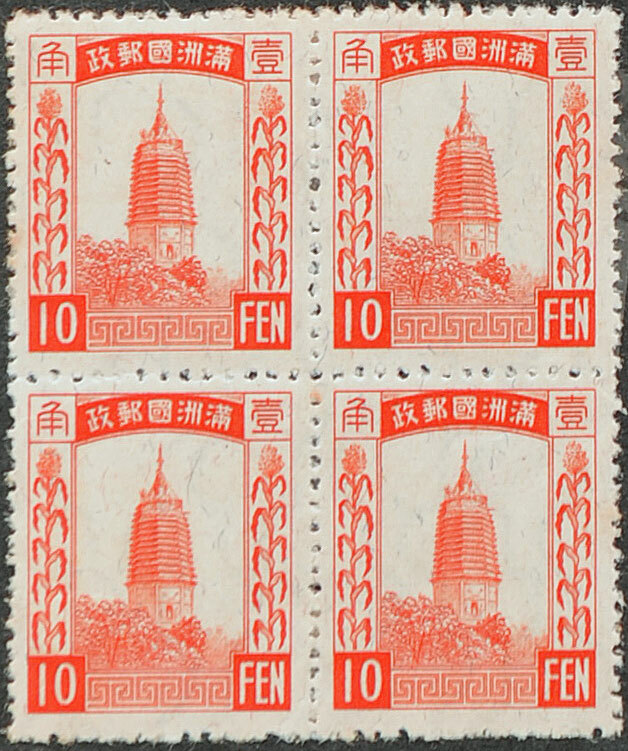 The ½fen to 10fen depict the White Pagoda at Liaoyang with a 15f and 1Yuan showing Puyi, later to become Emperor Kang-teh. 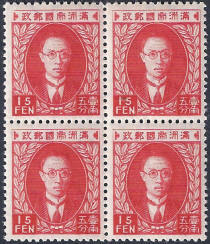 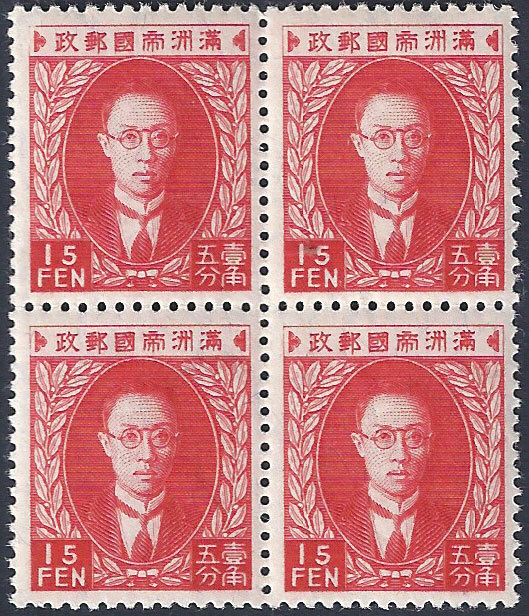 Note that this issue has five characters in the top banner reading "Manchu State Postal Administration"
This set was issued on 1st March 1934 to commemorate the enthronement of His Imperial Highness Aisin Gioro Puyi who became Emperor Kang-Teh exactly two years after the formation of Manchukuo. 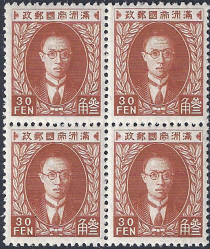 This new era was named "Kotoku" (peaceful benevolence) and again the Manchukuo year date on postmarks started with a one. 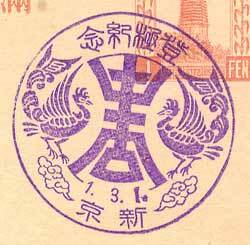 Above is the First Imperial Rescript with the seal of Puyi that announced the founding of the new state. The stamps were recess printed on watermarked (see below) "granite" paper, originally sheets of 100. 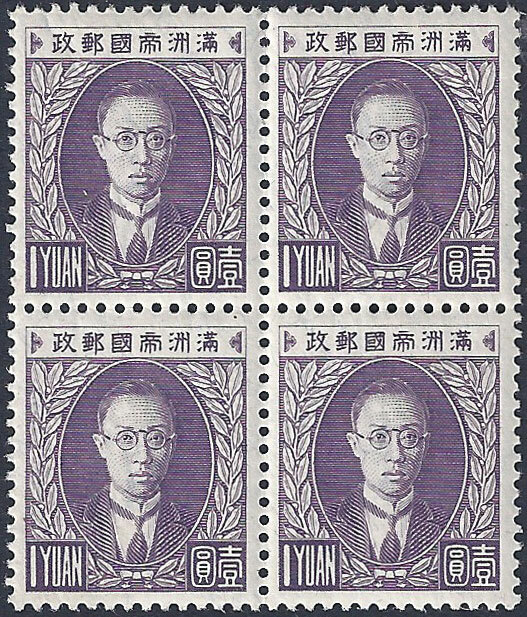 Engraved by the Japanese Government Printing Office in Tokyo. 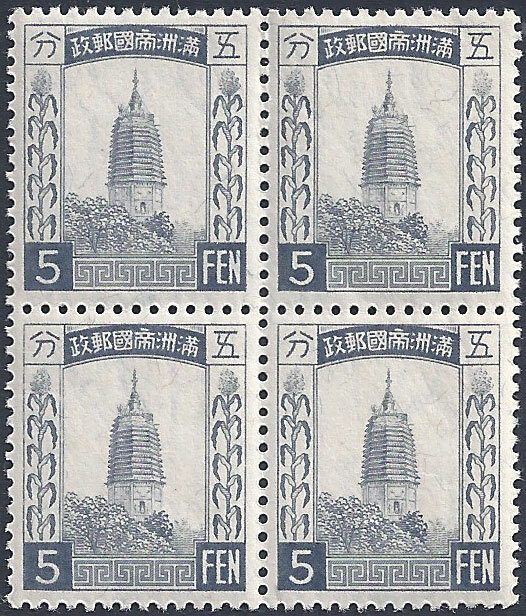 In addition to the stamps the post office also issued two commemorative postcards in a special folder, these can be seen here. 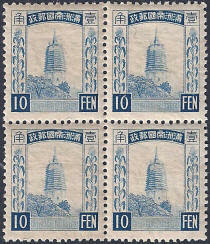 Designs by Mr Tameji Oona. 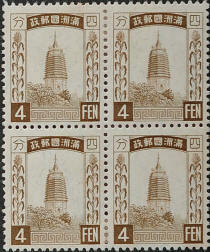 The stamps are 23.5mm x 26.5mm. 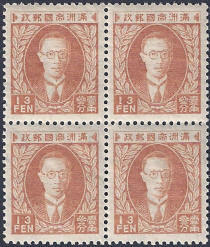 Perf 12½. 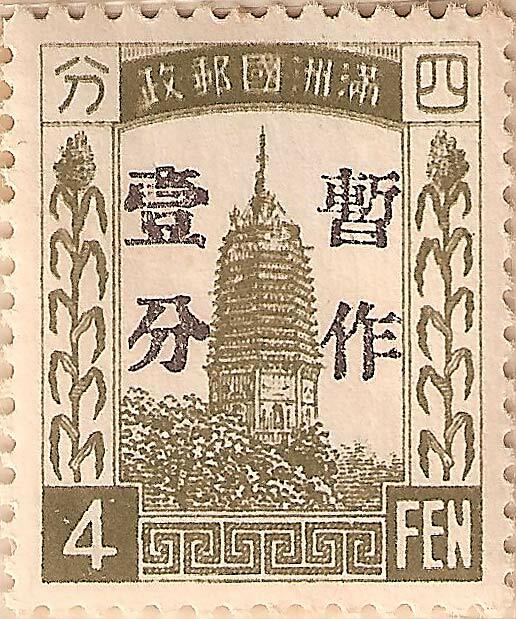 The 1½fen and 6f depict The Quinmin building which was the office in which Puyi conducted all official business, such as receptions for foreign ambassadors, it also housed the famous Imperial throne room. 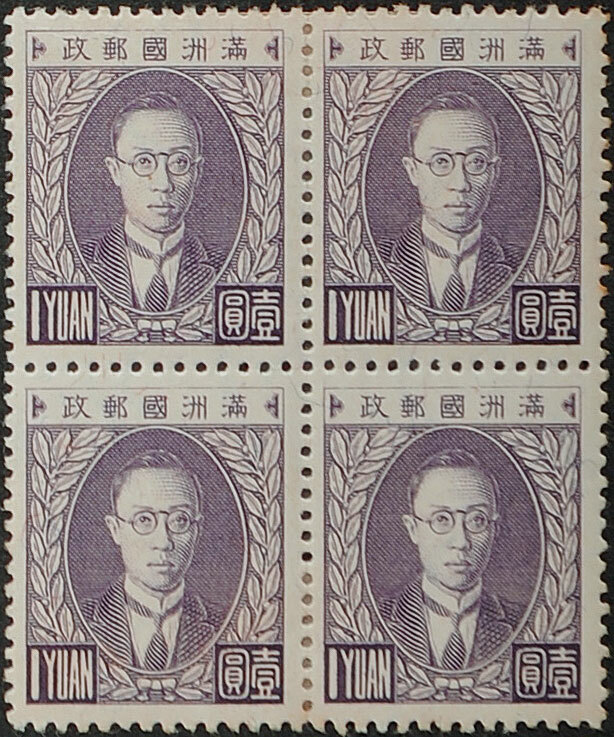 Puyi and his immediate family, wife Wan Rong and concubine Tan Yuling, lived in the Jixi Building another part of the Imperial complex. 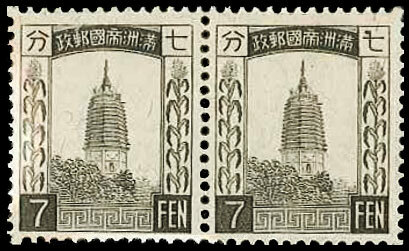 Both buildings are now museums. 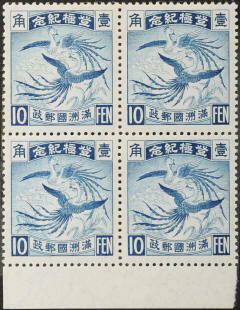 The 3f and 10f show two Pheonix, emblematic of Imperial rule.. 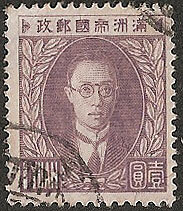 This cancellation marks the enthronement of Puyi as the Emperor Kang-Teh. 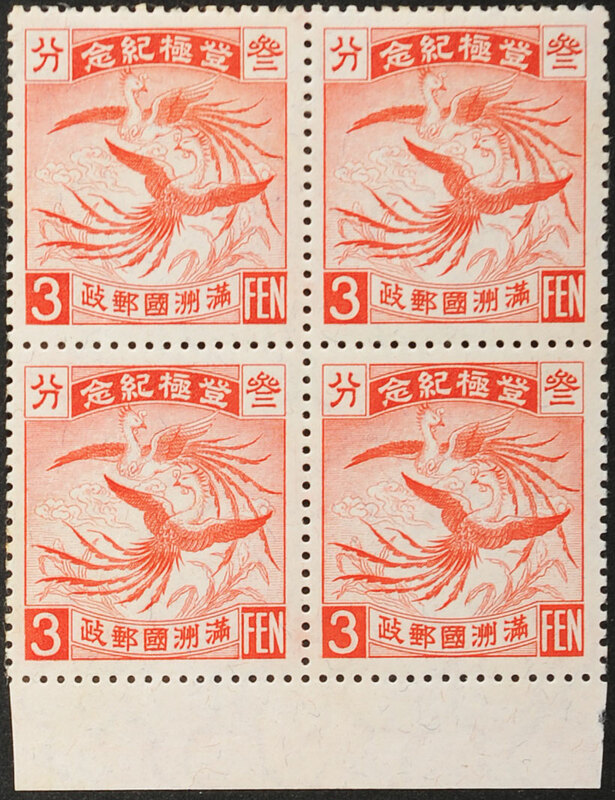 The central characters means long life and this is flanked by Feng Huang the mythical lords of all birds and auspicious clouds. 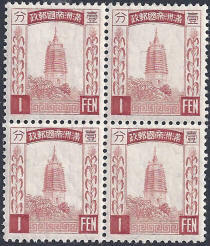 In 1935 the issue was reprinted in miniature sheets of 20 for presentation purposes only. 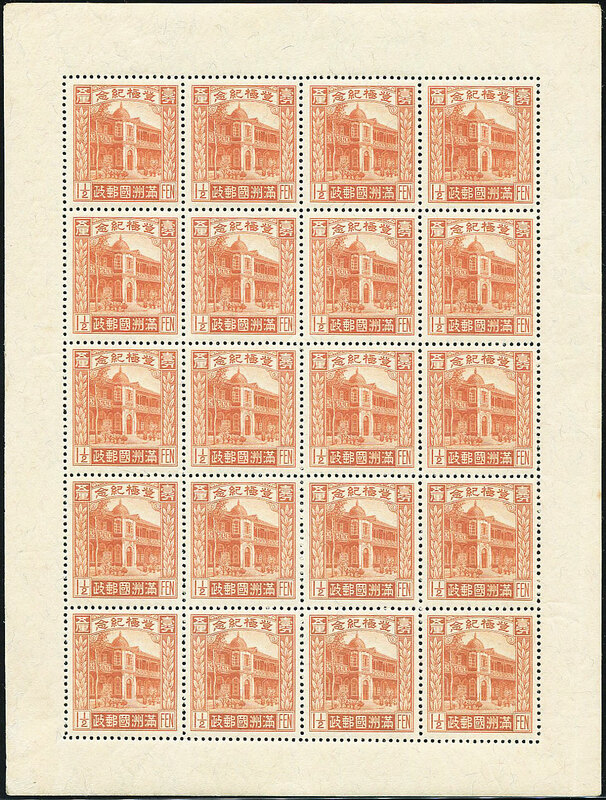 These sheets were not available to the public and so are very rare today. 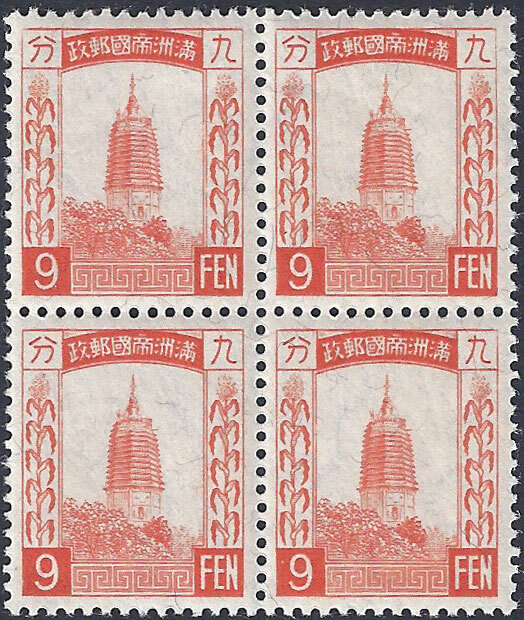 Issued 1st June 1934. 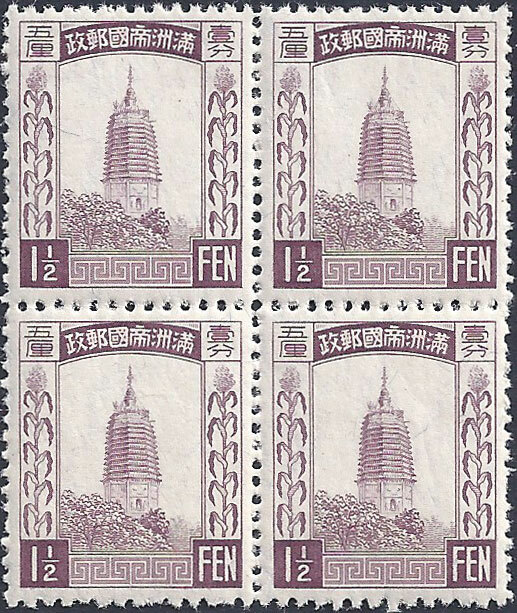 These surcharges were applied in Harbin to stamps of First Regular Issue of 1932 due to shortages in supply of the 1f denomination, used for local (Intra City) letters and postcards. 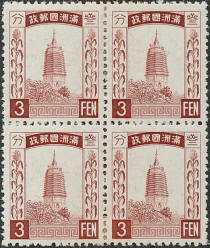 The reduction in the general postcard rate from 2f to 1½f may also have produced an increased demand. 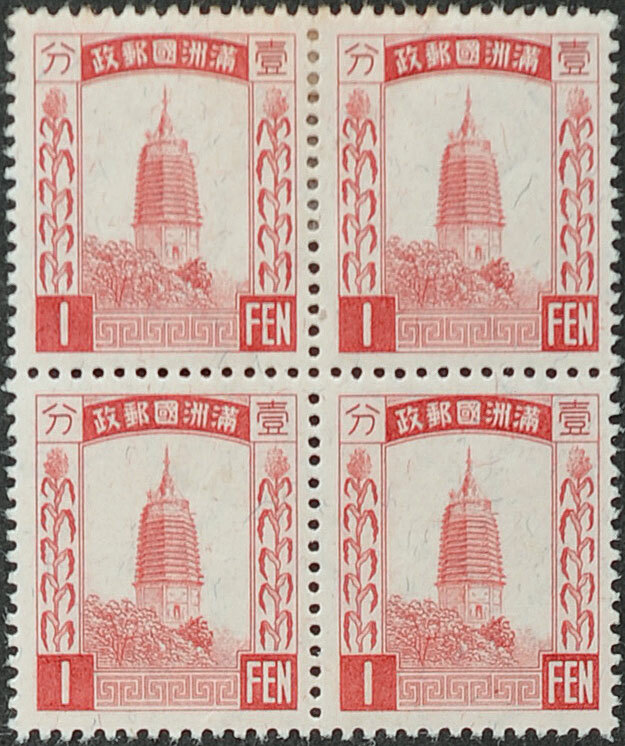 The overprint characters were written vertically and then from right to left, which is the traditional style of writing Chinese. 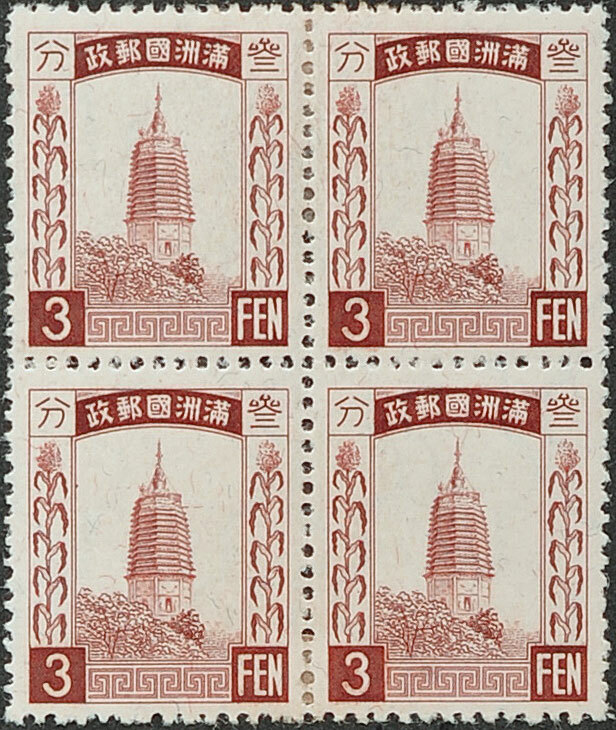 The two characters on the right mean 暫作 temporary use, and the two characters on the left mean 壹分One fen (i.e. 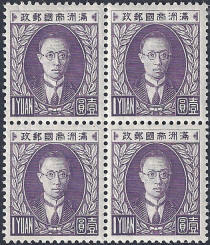 the new denomination of the stamp). 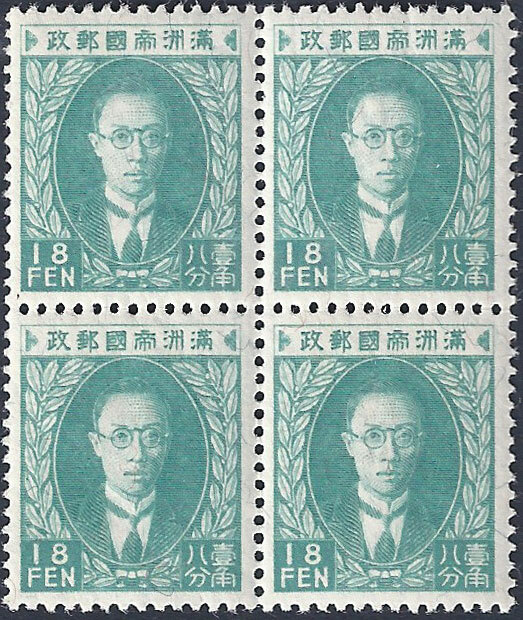 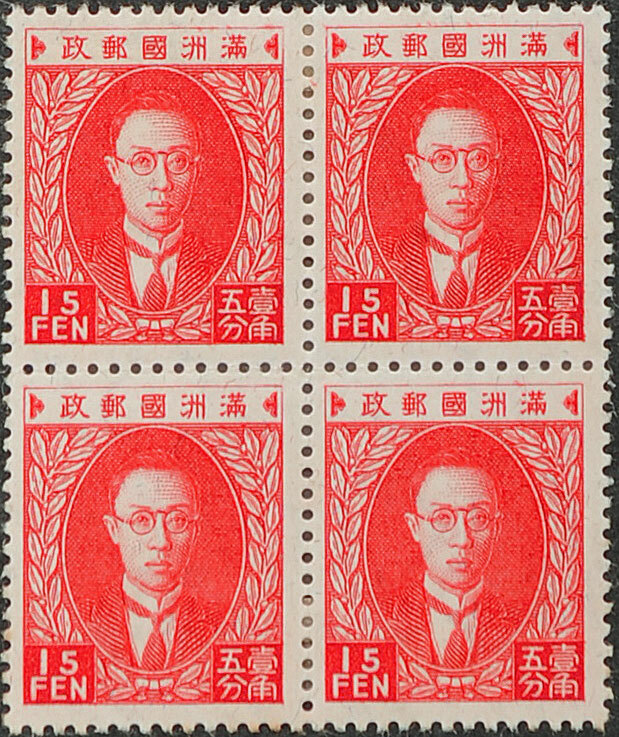 Akagi, in his book The Postage Stamps of Manchukuo speculates that there were only three set-ups used for over-printing sheets of stamps. 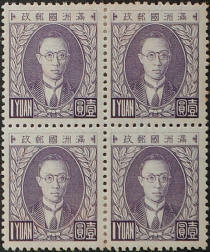 This he based upon small differences in the character 壹 "yi" meaning 1. 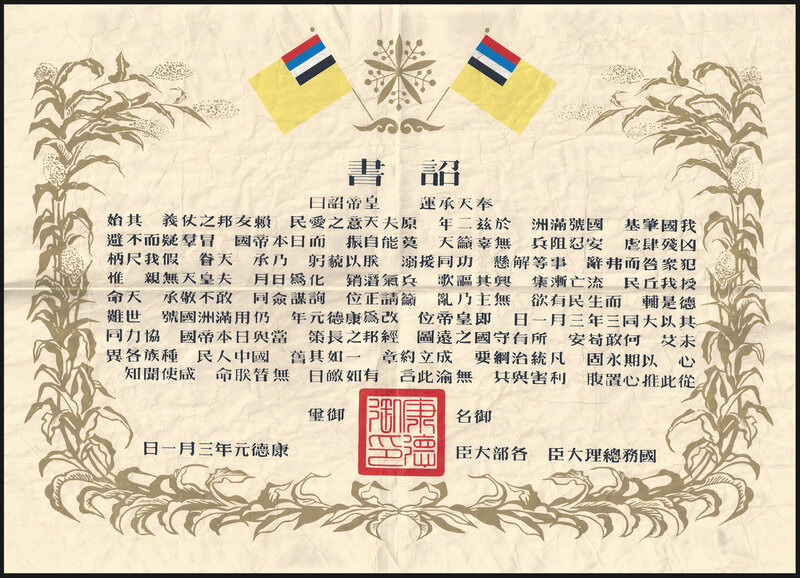 He says in his book that at the time, very little data was available, and in fact his sample was too small making his widely copied diagrams meaningless. 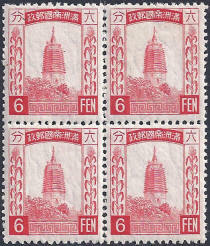 This error was not repeated in the later book written by Helen Zirkle. 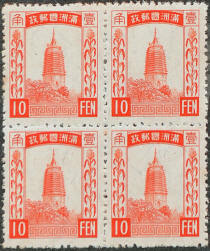 Imprinted postcards were also surcharged as a result of the new pricing - see the Postcards page for more information. 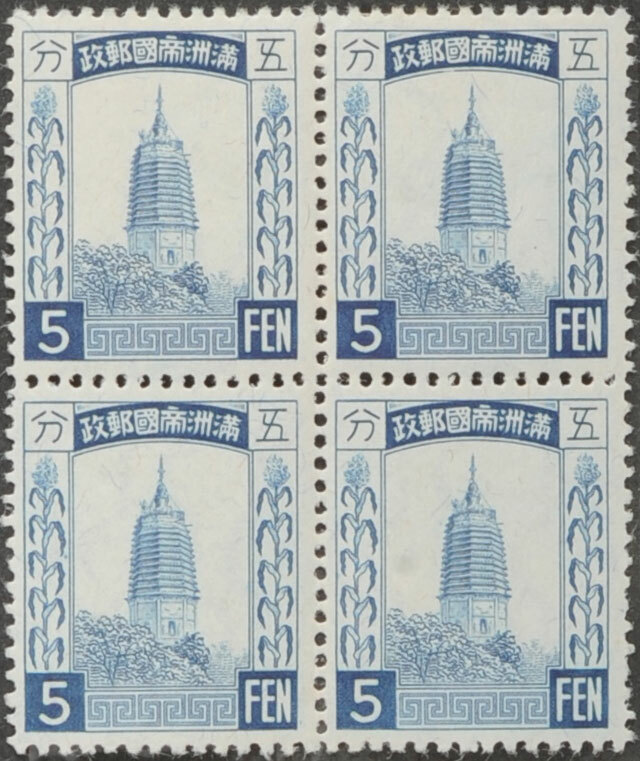 Typographic overprinting by the Chikazawa Yoko Company in Harbin. 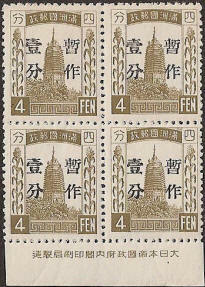 1f on 4f 1932 Issue (No Watermark) surcharged in black but also brown ink. 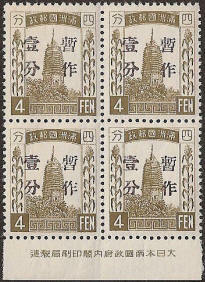 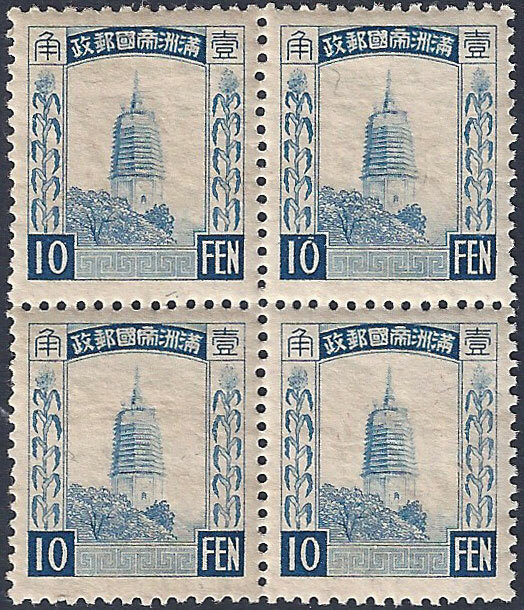 Four different dies were used to overprint these stamps and the differences can be seen by looking the blob at the right hand end of the line at the foot of the Chinese character meaning 1. 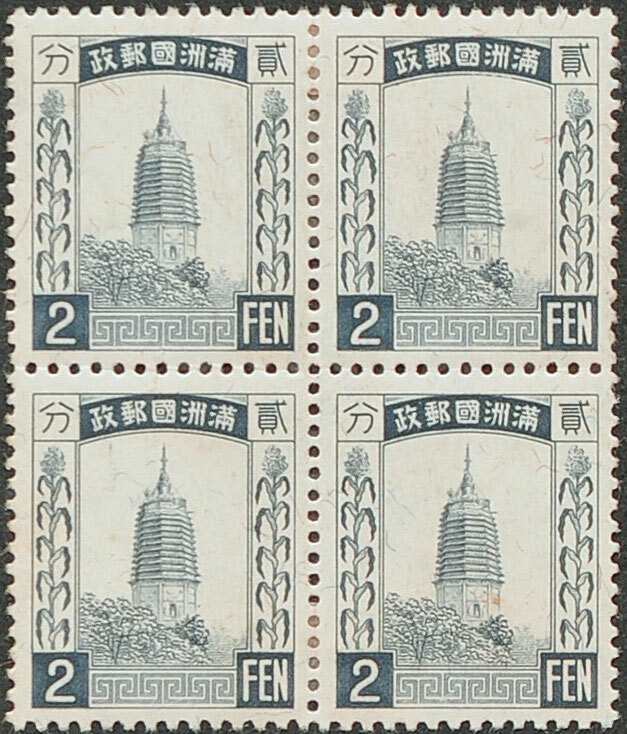 Sketches by Akagi and Zirkle show this but the enlarged scans above give a clearer picture. 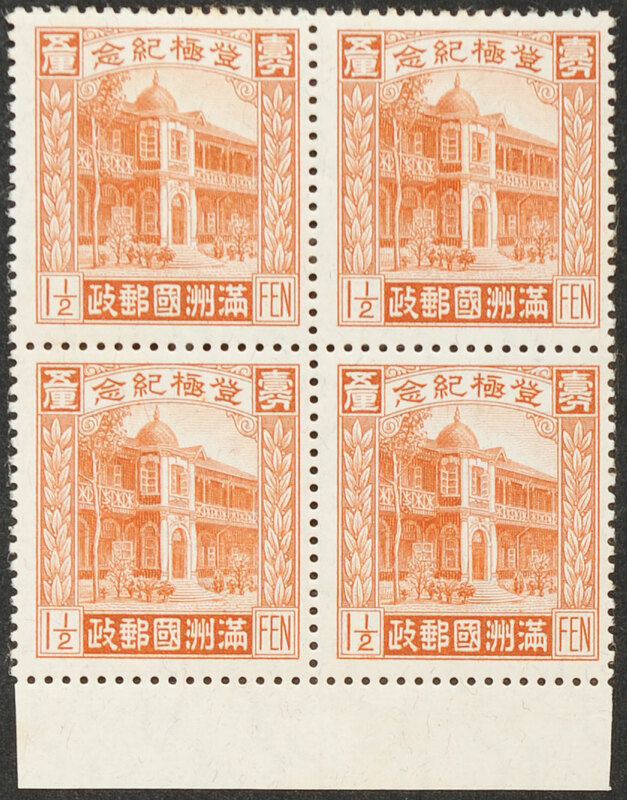 The same dies were used with the copies surcharged in brown ink. 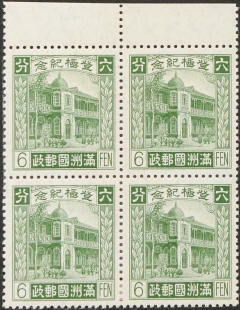 This set was issued from November 1934 with some values added later. 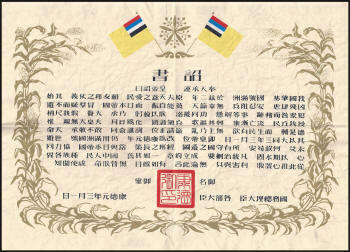 Previous issues had five characters in the banner at the top reading 政郵國洲滿 " Manchu State Postal Administration" after Puyi became Emperor Kang-teh this was changed to read 政郵國帝洲滿 "Manchu State Imperial Postal Administration" the addition of a sixth character, makes this set instantly recognisable. 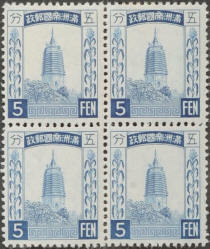 The 5f stamp in blue was replaced with a 5f stamp in grey in July 1935, to avoid confusion with a 10f blue which was released (along with a 13f pale brown) at that time. 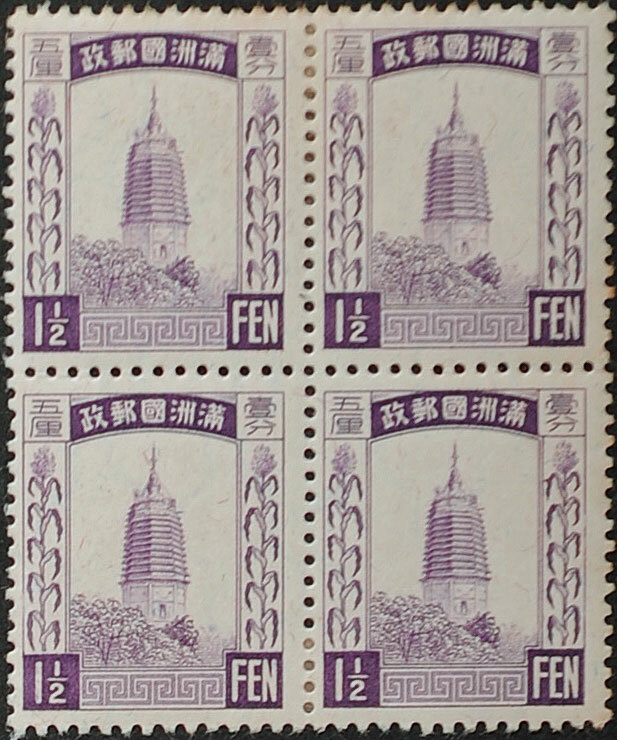 The third regular issue underwent many reprints, with slight differences is both ink and paper, many shades are found, the most noticeable being the 1Yuan light violet. 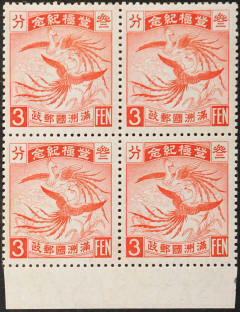 The changes in colour have led some collectors to conclude that litho printing was used for some of the later examples - but this is not thought to be the case. 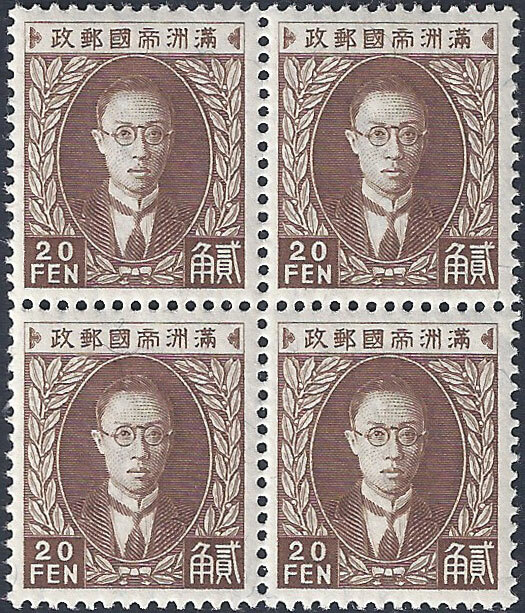 The stamps were recess printed on watermarked (see below) "granite" paper in sheets of 100 by the Japanese Government Printing Office in Tokyo. 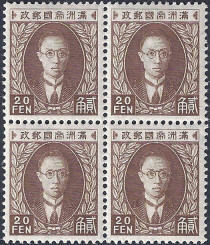 Designs by Mr Yutaka Yoshida. 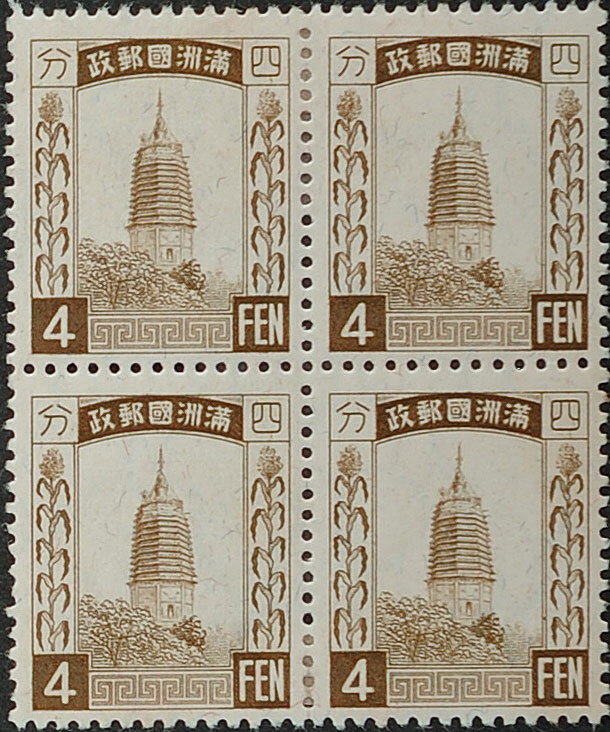 The stamps are 18.5mm x 22.5mm, Perf 13 x 13½. 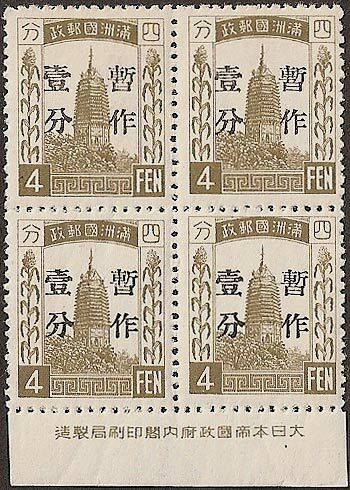 In addition to sheets of stamps the 1½f and 3f were also issued in booklets during December 1935, the number of these booklets to be issued was low so both booklets and booklet panes are scarce. 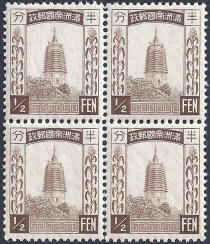 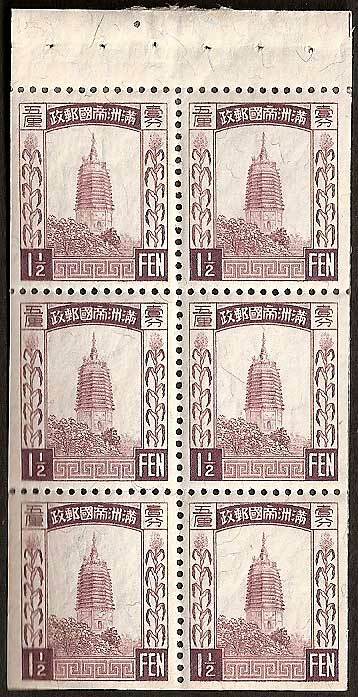 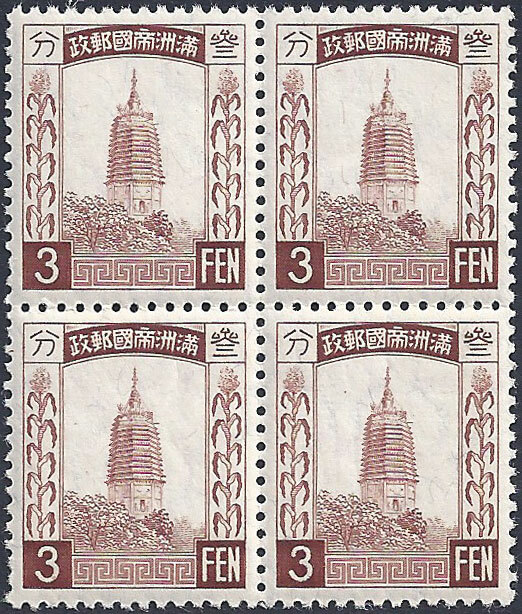 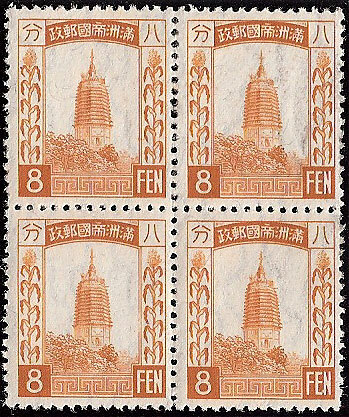 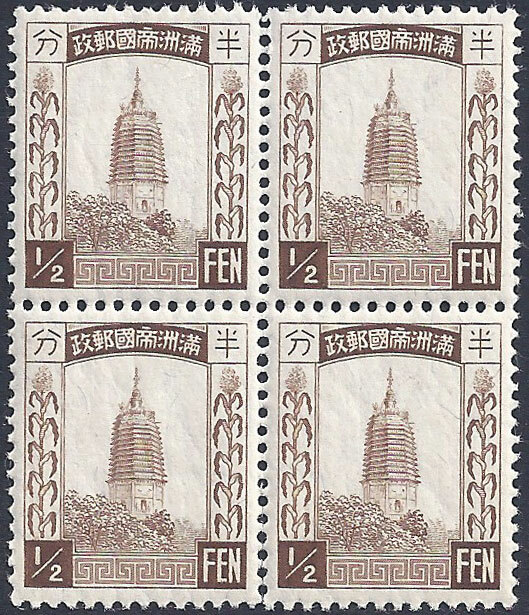 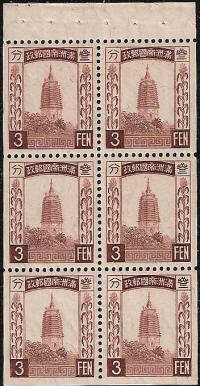 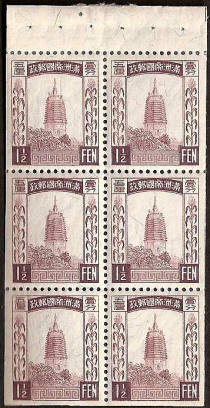 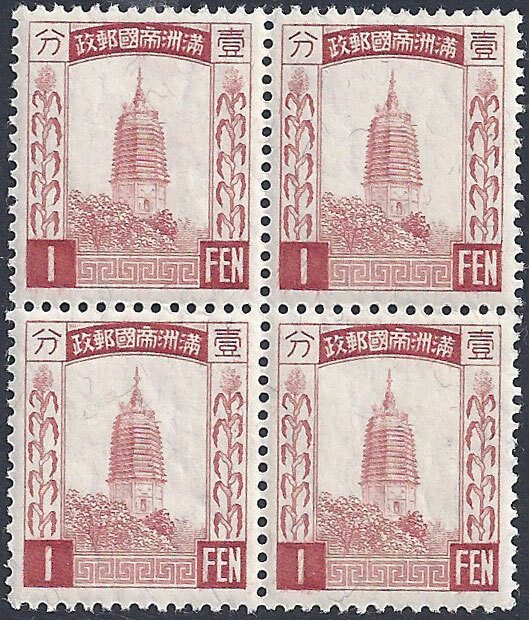 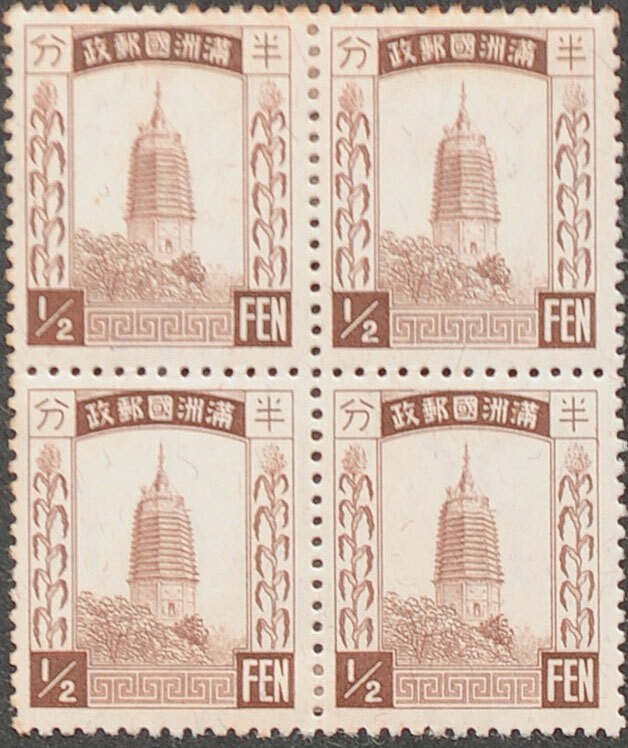 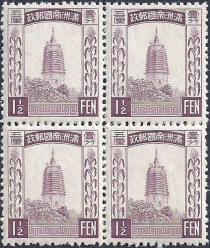 In this issue the ½f to 9f depict the White Pagoda at Liaoyang 15f to 1Yuan showing The Emperor Kang-teh. 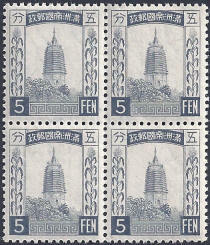 The two most commonly used values were produced in booklet form and these were issued on 25th December 1935. 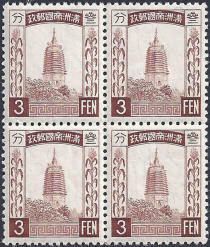 The booklets contained either 1½f and 3f stamps. 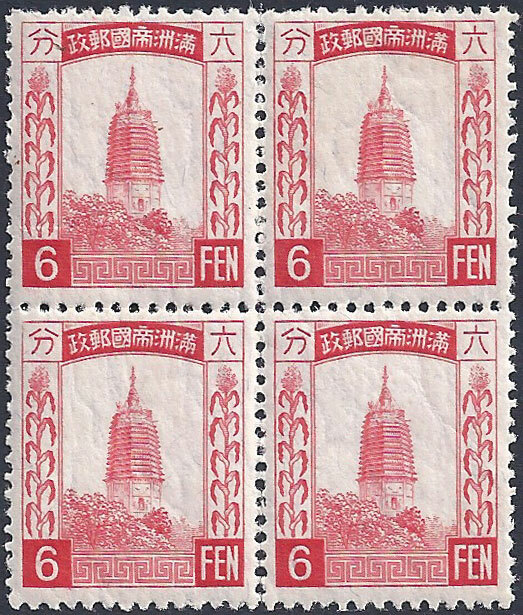 An "unexploded" 1½f booklet contains 10 panes and the 3f booklet contains 5, meaning that the cost of each booklet was 90f. 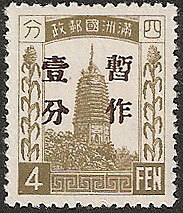 An 8f stamp was prepared for use in this series but was never issued, Some stamps, stolen by postal workers, did however find their way onto the market via stamp dealers. 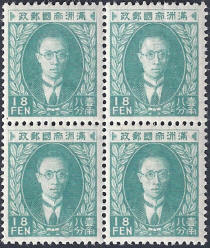 On occasion these stamps were used on letters, although illegally, and used covers can be found including this stamp.